ISO 50001 Energy management systems – Requirements with guidance for use is a specification created by the International Organization for Standardization (ISO) for an energy management system. The standard specifies the requirements for establishing, implementing, maintaining and improving an energy management system, whose purpose is to enable an organization to follow a systematic approach in achieving continual improvement of energy performance, including energy efficiency, energy security, energy use and consumption. The standard aims to help organizations continually reduce their energy use, and therefore their energy costs and their greenhouse gas emissions. ISO 50001 was originally released by ISO in June 2011 and is suitable for any organization, whatever its size, sector or geographical location. The second edition, ISO 50001:2018 was released in August of 2018. The system is modelled after the ISO 9001 Quality Management System and the ISO 14001 Environmental Management System (EMS). Eccleston describes the procedural details of the ISO Energy Management System (EnMS) and compares its procedures with those of the ISO 14001 EMS. A significant feature in ISO 50001 is the requirement to "... improve the EnMS and the resulting energy performance" (clause 4.2.1 c). The other standards mentioned here (ISO 9001 and ISO 14001) both require improvement to the effectiveness of the Management System but not to the quality of the product/service (ISO 9001) or to environmental performance (ISO 14001). It is anticipated that by implementing ISO 9001 and 14001 together an organization would improve quality and environmental performance, but the standards do not currently specify this as a requirement. ISO 50001, therefore, has made a major leap forward in 'raising the bar' by requiring an organization to demonstrate that they have improved their energy performance. There are no quantitative targets specified – an organization chooses its own then creates an action plan to reach the targets. With this structured approach, an organization is more likely to see some tangible financial benefits. The main objective of the standard is to improve energy-related performance and energy efficiency continuously and to identify energy reduction opportunities. This systematic approach will help organizations to establish systems and processes. Consistent energy management helps organizations to realize untapped energy efficiency potential. They will benefit from cost savings and make a significant contribution to environmental and climate protection, for example by the permanent reduction of CO2 emissions. The standard should alert employees and in particular the management level to the immediate and long-term energy management gains that can be made. The organization can discover potential savings and competitive advantages. Furthermore, a huge image boost for the organization can be created. In tandem, governments increasingly want to reduce the Greenhouse Gas Emissions of their citizens and industries, and are imposing legislative mechanisms to compel carbon reduction more and more frequently. In response, a range of energy management standards, specifications and regulations were developed in Australia, China, Denmark, France, Germany, Ireland, Japan, Republic of Korea, Netherlands, Singapore, Sweden, Taiwan, Thailand, New Zealand and the USA. Subsequently, the European Committee for Standardization (CEN) developed EN 16001:2009 Energy management systems. Requirements with guidance for use as a first international energy management standard. This was published in July 2009 and withdrawn in April 2012 as it had been superseded by ISO 50001. The United Nations Industrial Development Organization (UNIDO) recognized that industry around the world needed to mount an effective response to climate change. It also noted a proliferation of national energy management standards that were emerging as a response to market demand for help with energy efficiency. In April 2007, a UNIDO stakeholders meeting decided to ask ISO to develop an international energy management standard. ISO for its part had identified energy management as one of its top five areas for the development of International Standards and, in 2008, created a project committee, ISO/PC 242, Energy management, to carry out the work. ISO/PC 242 was led by ISO members for the United States (ANSI) and Brazil (ABNT). In addition, its leadership included the ISO members for China (SAC) and the United Kingdom (BSI Group) to ensure that developed and developing economies participated together in the project committee. Experts from the national standards bodies of 44 ISO member countries participated and another 14 countries sent observers. Development organizations including UNIDO and the World Energy Council (WEC) were also involved. ISO 50001 also drew on existing national and regional energy management codes and standards, including ones developed in China, Denmark, Ireland, Japan, Republic of Korea, Netherlands, Sweden, Thailand, the USA and the European Union. ISO 50001:2011 Energy management systems – Requirements with guidance for use was published on June 17, 2011. ISO published a revised version of ISO 50001 in 2018. The revision reflects a desire to promote adoption of the standard among small and medium sized enterprises. It also incorporates ISO's "high level structure" for use where organizations wish to integrate a number of management system standards together. The structure of ISO 50001 is designed according to other ISO management system standards, in particular ISO 9001 (Quality Management Systems) and ISO 14001 (Environmental Management Systems). 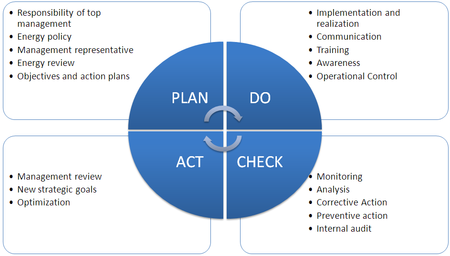 Since all three management systems standards are based on the PDCA cycle, and now share the same high level structure, ISO 50001 can be integrated easily to these systems. The overall responsibility for the installed energy management system must be located with the top management. An energy officer and an energy team should be appointed. Furthermore, the organization has to formulate the energy policy in form of a written statement which contains the intent and direction of energy policy. Energy policy must be communicated within the organization. The energy team is the connection between management and employees. In this phase the organization has to identify the significant energy uses and prioritize the opportunities for energy performance improvement. The stated objectives and processes are now introduced and implemented. Resources are made available and responsibilities determined. Make sure that employees and other participants are aware of and capable of carrying out their energy management responsibilities. The realization of the energy management system starts. An energy management system requires a process for compliance and valuation of energy-related regulations. Internal audit can help to verify that the energy management system is functioning properly and generating the planned results. The processes are monitored with regard to legal and other requirements (customer requirements, internal policies) as well as to the objectives of the energy management of the organization. The results are documented and reported to top management. The top management prepares a written valuation based on the internal audit. This document is called the management review. The results will be evaluated on their performance level. If necessary, corrective or preventive actions can be initiated. Energy-relevant processes are optimized and new strategic goals are derived. Certification proves that the energy management system meets the requirements of ISO 50001. This gives customers, stakeholders, employees and management more confidence that the organization is saving energy. It also helps to ensure that the energy management system is working throughout the organization. Another advantage of a certification is its emphasis on continual improvement. The organization will continue to get better at managing its energy. Additional cost savings can be generated over several years. Furthermore, certifying an organization shows your public commitment to energy management. UKAS, the certification bodies' accreditation scheme in UK, accredits certification bodies to carry out certification of business energy management systems to ISO 50001. In July 2018 there were 15 UK bodies with the necessary accreditation to carry out independent audits and issue Energy Management Systems Certification to ISO 50001. ISO reported that the standard was warmly received by the market when it was first published. To the end of January 2012, around 100 organizations in 26 countries had already achieved certification to ISO 50001. ISO also listed several users who had reported significant early cost savings and benefits. In China, Delta Electronics, a provider of power and thermal management solutions, reported reducing power consumption by 10.51 million kWh as compared to the same period in 2010. This is equivalent to a reduction of 10.2 thousand tons of carbon emissions and a saving of CNY 8 million ($1.2m). In India, the Dahanu Thermal Power Station in Maharashtra expected to accrue annual savings of about INR 96.4 million ($1.7m) from raised energy efficiency and management. In Austria, the municipality of Bad Eisenkappel, with 2,400 inhabitants, expected its consumption of energy to be reduced by nearly 25 per cent, with the main savings achieved by updating the waste water plant and reducing energy consumption by 86 000 kWh, equivalent to €16,000 ($20.7k). BSI Group published a case study showing that Sheffield Hallam University in the UK reduced its carbon emissions by 11 per cent once it was certified to ISO 50001. This yielded annual savings of over £100,000 ($160.7k). In December 2013, the UK Department of Energy and Climate Change became the first Central Government department to achieve certification against the requirements of ISO 50001, leading by example with the belief that structured energy management will lead to substantial energy reductions and thus mitigate the effects of climate change. ISO has stated that it believes in due course the standard could influence up to 60 per cent of the world’s energy use. ISO 50001 is data driven and focuses on energy performance improvement, while ISO 14001 provides a more qualitative look at all significant environmental impacts of an organization. Both standards can be implemented individually or they can be integrated with each other, or with any other ISO management system standards, such as ISO 9001. If energy is an organization’s most significant environmental impact, ISO 50001 might be more appropriate than ISO 14001. Many organizations will manage energy successfully via ISO 14001, but especially in organizations where energy is a significant cost, ISO 50001 provides a more specific framework that enables organizations to apply a sharper focus to energy efficiency. Thomas Elliott Welch: Implementing ISO 50001 – While integrating with your environmental management system, TriMark Press, Inc., 2011. Eccleston C., March F., and Cohen T., Inside Energy: The Handbook for Implementing an ISO 50001 Energy Management Systems, CRC Press Inc. 300 pages (2011). ^ a b Eccleston Charles, March F., Cohen T., Inside Energy: Developing and Managing an ISO 50001 Energy Management System, CRC Press Inc. 300 pages (2011). ^ "Energy Management system". International Organization for Standardization. 2011-06-09. Retrieved July 30, 2011. ^ "ISO 50001 Energy Management | BSI Group". www.bsigroup.co.uk. Retrieved 2012-10-24. ^ a b "Win the energy challenge with ISO 50001" (PDF). June 2011. ISO. p. 11. Retrieved 30 Oct 2012. ^ "New standard to increase energy efficiency: EN 16001:2009". Euractiv.com. Retrieved 30 Oct 2012. ^ "BS EN 16001:2009". BSI. Retrieved 30 Oct 2012. ^ "Win the energy challenge with ISO 50001" (PDF). ISO. Retrieved 30 Oct 2012. ^ Pierre, Inge. "EN 16001: a powerful tool for Energy Management" (PDF). CEN/CENELEC. Retrieved 30 Oct 2012. ^ Fossa, Alberto J. "ISO 50001 Energy Management System the path, the birth story, the people involved, difficulties, challenges, relevant discussions…" (PDF). ABNT. Retrieved 30 Oct 2012. ^ "ISO 50001 energy management launch event". ISO. 21 June 2011. Retrieved 30 Oct 2012. ^ "ISO 50001 Energy management". www.iso.org. Retrieved 2012-10-24. ^ "Win the energy challenge with ISO 50001" (PDF). June 2011. ISO. Retrieved 30 Oct 2012. ^ Paeger, Jürgen. "Energiemanagementsysteme nach ISO 50001 (paeger consulting)". www.paeger-consulting.de. Retrieved 2012-10-24. ^ "ISO 50001:2018(en) Energy management systems — Requirements with guidance for use". ISO. Retrieved 20 December 2018. ^ "Energy Management". Retrieved 2018-07-23. ^ Johnson, Ian; et al. (14 March 2012). "ISO 50001 "on fire" - Energy management standard goes global". ISO. Retrieved 30 Oct 2012. ^ Lambert, Gary (12 July 2012). "Energy management - Early ISO 50001 adopters report major gains". ISO. Retrieved 30 Oct 2012. ^ "University reduces carbon emissions by 11 percent and total energy savings by £10,000 per month" (PDF). BSI. Retrieved 30 Oct 2012. ^ "How does the UK flagship office for protecting the UK's energy resources show its commitment to managing the use of energy efficiently and effectively within its own buildings?" (PDF). ^ "Win the energy challenge with ISO 50001" (PDF). ISO. June 2011. p. 1. Retrieved 30 Oct 2012.